Whether it’s for articles, websites, or social media – writing effective content isn’t always easy. First, you have to understand the dynamics of your audience and then meet their needs with benefit-oriented content. Why? Your efforts to increase credibility, exposure and traffic will fall short if readers can’t find how you benefit their bottom line. Getting to the core of your readers’ needs (and therefore effective content) can be difficult when you don’t know where to start. 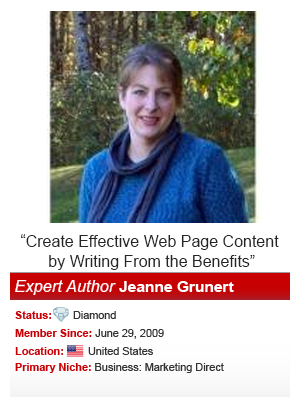 That’s why Expert Author Jeanne Grunert’s article, “Create Effective Web Page Content by Writing From the Benefits,” applies to not just web page content, but to articles as well. Jeanne’s tips resonate with experts in a variety of niches and help them reach their business objectives. Let’s explore a few highlights from Jeanne’s article. Even if your bottom line is all about benefiting you, the road to get there is all about your reader’s bottom line. Think from your audience’s perspective: Why are readers coming to you? What need are you fulfilling? What obstacle are you helping your readers overcome? If they are new to your platform, then it’s not because of your stellar brand and you offer “X,” “Y,” and “Z.” It’s because the reader is able to achieve their bottom line using the information you’ve provided. Understanding your audience’s motivation is the key to your success. Jeanne’s next strategy is nothing short of brilliant for developing effective, benefit-oriented content: Coordinate features with motivating benefits. Feature: What are you providing (e.g., products or tips)? Benefit: What does the reader get out of it; why do they care or what is motivating them? Use this template to help you easily prepare your content with your reader in mind. The sooner you practice your writing, the more invaluable and effective your content will become (and work ten times better for you!). Use methods like journaling to evaluate and then re-evaluate your ideas to discover whether they will benefit your audience. Talk to your audience, both on and off your platform to find out what caught their attention and continues to motivate them. Use this information to refine your message and continue benefiting your audience. Do you agree with Jeanne’s perspective about how to approach providing and organizing your business’ content? Have you tried the features/benefits strategy? Let us know – we’d love to hear from you! Don’t know who your audience is? Click here to discover the top 7 steps to finding your ideal audience. Yes, I do agree with you Jeanne. Great. But isn’t this too obvious? All content marketing gurus preach the same. Yet, somehow, we always veered away from the well-trodden path of effective article writing. Surely the more one writes the better one gets at writing! Jeannne, great article. I am still surprised how the obvious must be repeated over and over again to writers. This is exactly what I am facing, I have been putting in my best but the traffic is not encouraging. I will follow your suggestions. I am impressed. Jeanne, I read your article and agree to a degree, but I often times wonder if the end-user even knows what he/she is looking for. I think keywords are essential in the early stages of article formatting. Writing for the benefit of others seems like a challenging endeavor. This was a very helpful article considering I am just starting my first website. My traffic is low but I am only in the early stages. Your information I believe will be very helpful along my journey. Thankyou. Having enjoyed a successful career as a sales manager and trainer I fully concur with the need to provide benefits. Bloggers are often guilty of feature dumping without taking the time to explain what is in it for their readers. Sadly these sites are missing out on the opportunity to cement real value. Once again, thanks for sharing and good luck for the future. I agree with you Jeanne, albeit the obvious is not something you can get a degree in and many claim to have a Masters in it. Coming up with “features and benefits” is an excellent strategy when it comes to keeping your prospect in mind. I learned this strategy from my work and knowledge of copywriting. Great info Jeanne. I think your idea of adding features and benefits is an excellent point to address in some of my personal finance posts on my blog. Hey Jeanne thanks for your valuable suggestion as i m trying hard to write attractive content but I don’t know where I’m lacking hope your advice will help me in my way..